Welcome to the Exciting World of Winter Alpine Sports! Don’t be shy, don’t be scared – we all had to start somewhere! Admittedly those who have been on snow since they could walk definitely make it look easy. However, it’s never too late to learn. Your reason to start may be to go with friends, share more time with your kids, expand your active lifestyle, or give your kids a new hobby. The reasons are endless. But whatever your reason, we want to help make it as easy and as fun as possible. Before you embark on your new adventure you will have to choose whether you are going to try skiing or snowboarding first. Remember this choice is not written in stone for the rest of eternity – many people do both! You just need to have a plan of attack. 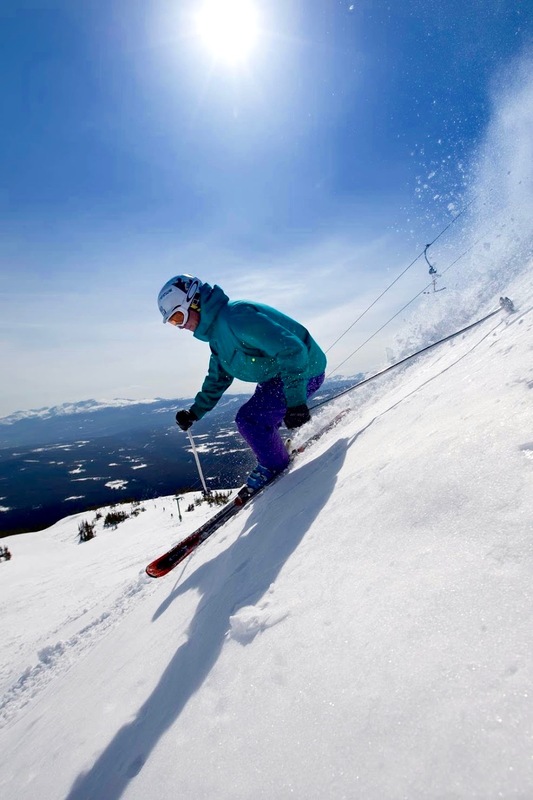 Skiing and snowboarding have very different learning curves. 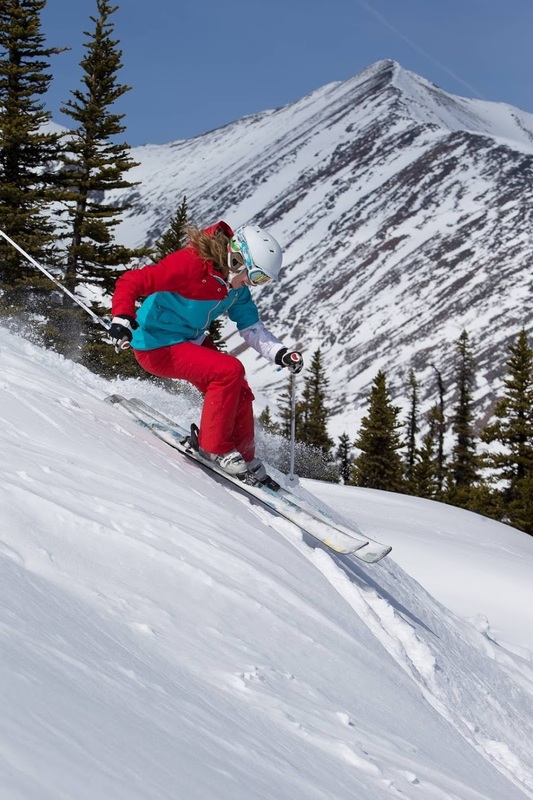 Skiing takes less time to learn but longer to become an advanced skier. Snowboarding takes more time to learn but less time to become a good rider. This means that your first day of snowboarding will probably not go much further than the bunny hill, however on your first day on skis, you may get to the top of the mountain! Although there are always the exceptions that can catch on immediately. Your drive and determination to learn can make your day and solidify your success. Maybe all your friends snowboard, so you have set your heart on learning to ride. Maybe your friends are too patient, so you want to become mobile quickly. Or, maybe you just want to be able to explore the mountain confidently on whichever sliding apparatus you dreamed about using. The choice is up to you. And remember, you can always change your mind. It’s Your Turn. Check out this video from CSIA. Taking a lesson from a qualified instructor is a great idea for your exciting first day. Your instructor will ensure you learn everything you need to know, they will make sure you stay safe, warm and comfortable and they will get you well on your way to being the best skier or snowboarder you can be! We are not exaggerating when we stress how much a lesson helps in your goal of having an enjoyable day. 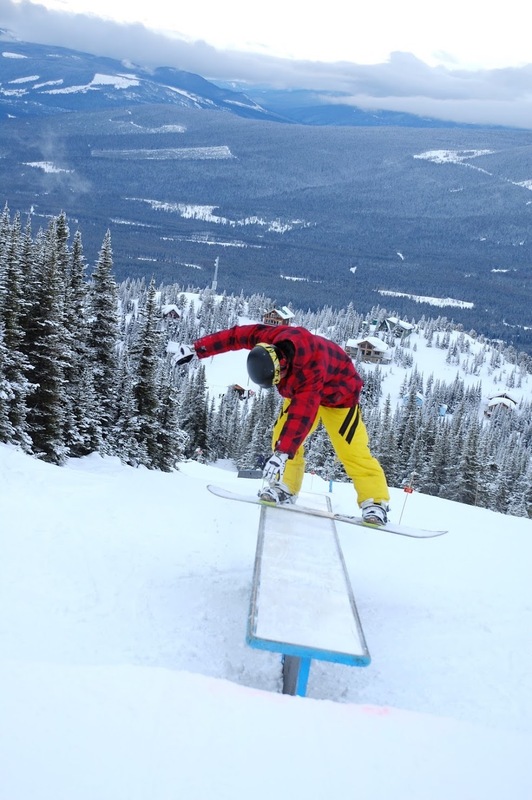 Our Snow School has several friendly and patient instructors who are trained, qualified and excited to lend a hand. Hudson Bay Mountain also has a program designed just for people like you called the Discover Package. It includes a full day lift pass, full day rental package and a beginner lesson all for one low price. It is recommended that you call ahead (778-648-4426) and reserve a lesson for when you are visiting to ensure there is an instructor ready and waiting for you to arrive. Click here here for our lesson options. 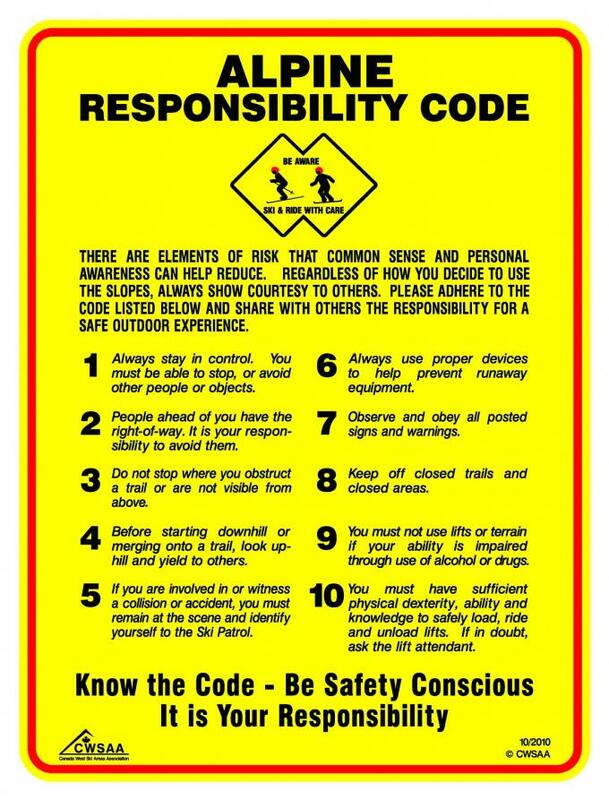 It is a good idea to familiarize yourself with the Alpine Responsibility Code before you head up the mountain and always keep it in mind as you are enjoying yourself on the hill. The Code is list of safety points to follow to make sure that you and everyone else has fun and goes home safe at the end of the day. Click here to see the Alpine Responsibility Code. Mountain weather is unpredictable and can be very harsh at times. Don’t let that scare you – it can be very beautiful too! You need to be prepared and aware that anything can happen up there. First things first, you need good snow gear. For maximum comfort all items should be waterproof or even better, Gore-Tex. Jacket, snow-pants, gloves or mittens, toque or helmet (warmth and protection – can’t beat that! ), goggles help with sun or blowing snow. If it’s extra cold out, a facemask, neckwarmer or balaclava are sublime. We provide the handy ‘Snow Phone’ (250-847-2550) which is updated daily with every tidbit of weather, temperature, event and mountain information you will ever need to prepare yourself for a great day. Next comes the equipment. If you are trying it out for the first time, renting may be your best option. Our rental shop has a large selection of quality rental gear, but if you are coming up on a busy day such as over the Christmas holidays, don’t hesitate to email snowschool@hudsonbaymountain.com to reserve your rentals. When you get to the rental shop, you will have to fill out a rental form with all your information and remember that children under 18 need an adult to sign their form. If you are borrowing from a friend there are a couple of very important things to remember. If you are snowboarding, make sure the boots fit and are comfortable, that the boots fit in the bindings, and that the board is the right size for you (should the height from between your chin and nose). If you are skiing, make sure the boots fit and are comfortable, and always come into the rental shop to make sure the ski bindings are set for your boot size, height, weight and skier ability (these are the factors we use to calculate the tightness setting on your ski bindings to ensure they stay on as required and release properly when they need to). If you are buying your own equipment, make sure you shop around and try on as many boots as possible to find the right ones for you. Many stores have demo equipment you can try before you buy. Although we try to make our mountain road as safe and accessible as possible, it can sometimes be affected by winter conditions. Always make sure you are in a car or truck that has good winter tires. Studded tires are not required but tire-chains are. Four-wheel drive is also recommended to get you up and down without a problem. We also have a Mountain Bus that runs every day that we are operational. The bus is a great way to get up and down the mountain reliably. Please check out the Mountain Bus page for pickup locations and times. It doesn’t hurt to check out our Trail Map before heading up to make sure you get your bearings beforehand. Once you are on the mountain, visit Guest Services and they will be pleased to help you with anything you need. We hope that we have covered everything you need to know about getting into skiing and snowboarding. Please don’t hesitate to call us with any more questions, concerns, or feedback.